Macroprudential policy has been described as the missing link in the broader monetary and financial policy framework (Schoenmaker 2014). Following the global financial crisis there has been considerable regulatory change, and macroprudential policies have become part of many central banks’ toolkits. The tools are being used actively – a recent IMF survey revealed over 40 countries had used some kind of macroprudential instrument already. But so far the focus of macroprudential policy has largely been domestic – we have examined the notifications and press reports that countries have made about macroprudential measures, and found that cross-border effects barely get a mention. But a large body of research on the effects of regulatory changes shows that the spillover effects of policy can be substantial, and these effects can occur via multinational banks. Peek and Rosengren (1997, 2000) show that multinational Japanese banks retrenched their commercial, industrial, and real estate lending in the US to comply with new tighter capital regulation, with negative effects on the real economy. Aiyar et al. (2014) examine the effect of bank-specific capital requirements on foreign banks’ credit supply, and find that an increase in capital requirements of 100 basis points reduces lending abroad by 5.5 percentage points. And Houston et al. (2012) show that cross-country differences in regulation affect international bank flows as banks transfer funds to markets with fewer regulations. This is an important topic for policymakers and researchers alike. To enhance the understanding of the spillovers of macroprudential policies, the European Systemic Risk Board has set up a group to examine these effects and to consider appropriate policies for dealing with them. The International Banking Research Network is currently investigating how specific regulatory changes affect the scale, type, and location of banking activity. In new research (Danisewicz et al. 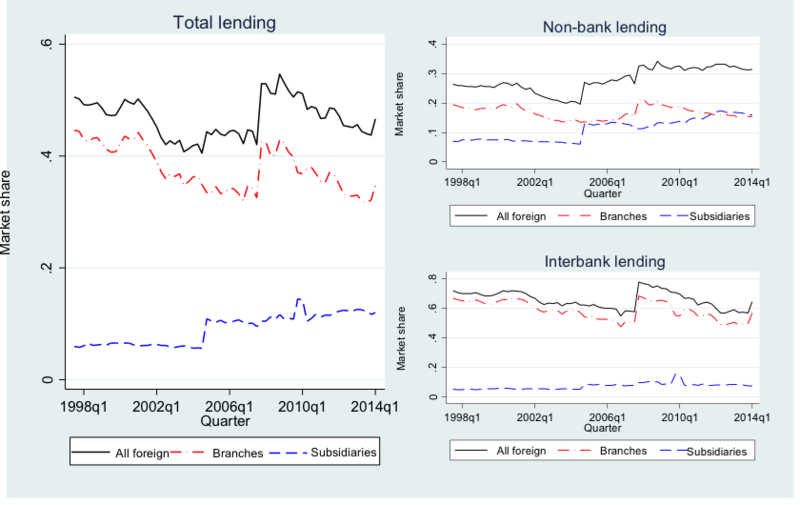 2015), we investigate the spillovers of macroprudential policy, and we ask how the change in lending abroad after a regulatory action is affected by whether the lending is done via a branch or a subsidiary. This issue is particularly important for the UK financial system as foreign banks constitute a large share of the market, providing around half of all lending to UK borrowers, and over 60% of lending in the interbank market (Figure 1). The UK is also an ideal country to examine our hypothesis as there are more than 150 branches and approximately 100 subsidiaries of multinational banks operating in the country and, in addition, there a number of banking groups operating under both organisational structures. Notes: Figure 1 presents evolution in the market share of total lending, lending to the UK non-bank sector, and interbank lending provided by branches and subsidiaries of foreign banks in the UK. We argue that the organisational structure should matter due to the legal distinction between branches and subsidiaries. In particular, branches are an integral part of the organisation, controlled by head office, while subsidiaries are separately capitalised and subject to host country regulations. We restrict our sample to institutions that belong to a banking group operating at least one branch and subsidiary over the sample period. This is crucial for our identification strategy as it allows us to control for banking group-time-varying factors affecting lending by branches and subsidiaries of these groups in the UK. This decreases our sample somewhat, but the banks in our final sample account for 75% of total foreign banks’ assets in the UK and we observe 40% of all the macroprudential regulatory changes in our original dataset. To answer our question of how regulatory spillovers differ depending on the organisational structure of banks we use a unique dataset of macroprudential actions. This builds on the work by Lim et al. (2011) and Kuttner and Shim (2012), but continues to update their work to 2014 by hand-collecting data from regulators’ websites and financial stability reports and communication with relevant authorities. This allowed us to build a dataset containing information on a wide range of macroprudential policy actions in 70 countries over the period 1990 to 2014. Although the early time period mainly covers actions taken in emerging economies, advanced economies have been more proactive in taking macroprudential actions since the global financial crisis. We cover any action that is ‘macroprudential’-like, rather than focusing on actions that have been specifically taken for macroprudential purposes. In our analysis we exploit information on adjustments to capital requirements, reserve requirements, and lending standards. Figure 2 shows that there have been a variety of macroprudential policy actions for each of the policies we consider. Measures have been taken both before and after the crisis. And there are both tightening and loosening actions in each category, though it is noteworthy that capital tightening actions were taken more frequently than capital loosening actions. Using the described identification strategy we find that an increase in capital requirements at home causes foreign branches to reduce their lending growth to other banks operating in the UK by 6.3 percentage points more than foreign subsidiaries. However, a tightening in lending standards and reserve requirements does not affect lending of branches and subsidiaries differently. Additionally, we find that none of the macroprudential regulations in our sample cause differences in the provision of lending to non-bank borrowers. We conjecture that this is because non-bank lending relationships are more likely to be relationship-based and therefore more profitable, and so will not be cut in response to a change in regulation. In contrast, banks are generally able to substitute funding in the interbank market more easily; this means that any attempt to pass on increased capital costs by an affected branch will be swiftly met by a bank finding an alternative lender, while a subsidiary will be less affected by the increased cost and so banks are less likely to find an alternative source of borrowing. Aiyar, S, C Calomiris, J Hooley, Y Korniyenko, and T Wieladek (2014), “The international transmission of bank capital requirements: Evidence from the UK”, Journal of Financial Economics 113: 368–382. Schoenmaker, D (ed.) (2014), Macroprudentialism, VoxEU.org eBook, CEPR Press. Danisewicz, P, D Reinhardt, and R Sowerbutts (2015), “On a tight leash: does bank organisational structure matter for macroprudential spillovers?”, Bank of England Working Paper 524. Peek, J and E Rosengren (1997), “The international transmission of financial shocks: The case of Japan”, American Economic Review 87: 495–505. Peek, J and E Rosengren (2000), “Collateral damage: Effects of the Japanese bank crisis on the United States”, American Economic Review 90: 30–45. Houston, J F, C Lin, and Y Ma (2012), “Regulatory Arbitrage and International Bank Flows”, Journal of Finance 67(5): 1845–1895. Lim, C, F Columba, A Costa, P Kongsamut, A Otani, M Saiyid, T Wezel, and X Wu (2011), “Macroprudential Policy: What Instruments and How to use them?”, IMF Working Paper 11/238. Kuttner, K N and I Shim (2013), “Can Non-Interest Rate Policies Stabilize Housing Markets? Evidence from a Panel of 57 Economies”, NBER Working Paper 19723.